On a theme of collaboration and discussion, it’s been a fantastically busy week here at Musical Futures! Monday saw Projects Officer Alexandra attended a safeguarding seminar hosted jointly by @ISM_music and @aborchestras, meeting with other music educationalists in the sector to discuss the various issues and action points around safeguarding and child protection. On Tuesday, Abi, Anna and Kevin headed over to the Music Mark offices to meet with staff to discuss our shared aims for music education, and our ongoing collaboration over #mufuchat. Speaking of which, the #mufuchat theme for this week was asking how to deliver composing in the classroom, and was hosted by primary music specialist Rob Wells. Read the chat archive here. We had a fleeting visit from Hadley from New Zealand, who popped by our offices to meet us all before he returns later in the month to join our Australian colleagues on a tour of Musical Futures schools here in the UK, and then also for the Music Learning Revolution, for which tickets are still available here. This week we’ve also been in lots of discussions this week about the various levels of affiliation to Musical Futures. MF has always been driven by teachers and practitioners, but also by Music Services, Hubs, Universities, both in the UK and overseas. We’re streamlining the ways in which people can work with us, and help Musical Futures to grow and develop. The starting point is here, but this is an area we are developing as a priority over the next few months. On Wednesday Kevin was pleased to meet Alex Jarman, Investor Relations from Investing for Good @Investing4Good, where they had an interesting chat about social investment, music and corporate links. Kevin later met with Chloe Brookes @chloe_a_brookes, Relationship Manager, Music at Arts Council England aka @ace_national to catch up on the latest funding opportunities, talk about MLR and the Autumn Spending Review. We were also delighted to be joined by other sector professionals on Wednesday for one of our informal networking events. @francescaxmas from Trinity College, staff from the English Folk Dance and Song Society, National Orchestra For All and the National Children’s Orchestras of Great Britain were in attendance for wine and inspiring discussion! To end the week Alexandra visited one of our Just Play pilot schools in Hackney to see how teacher and students were getting to grips with the material and resources. 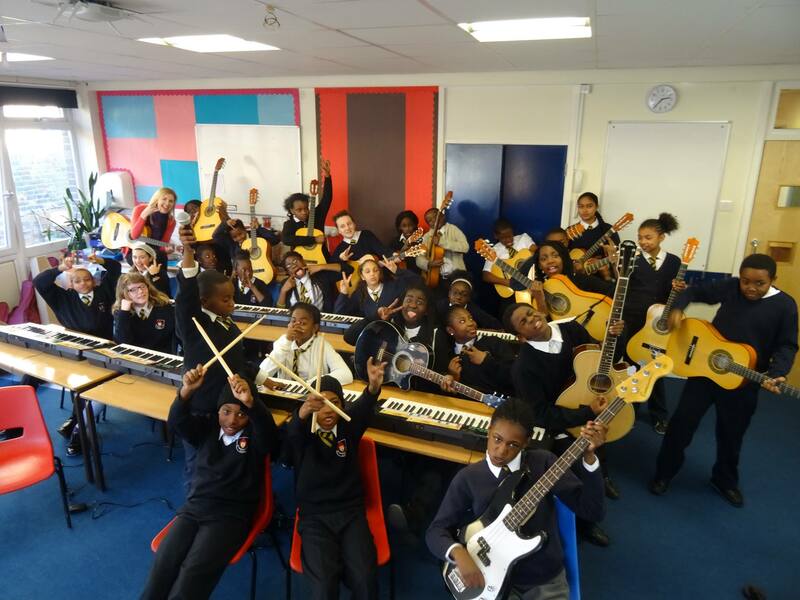 It was a fantastically inspiring second session for the group, during which every child spent the entire lesson playing either the guitar, keyboard, bass guitar or drumkit, building on new musical and teamwork skills. There’ll be many more visits over the coming weeks to see how the impact of the pilot project is building.